One helpful approach to scheduling can be to block out unavailable dates. This can be helpful if you are booking meetings or client appointments and wish to prevent specific times or dates from being booked. Although Teamup does not have a specific function to block unavailable dates or times, there is a way to implement blocked-out unavailable dates or times in your Teamup Calendar. 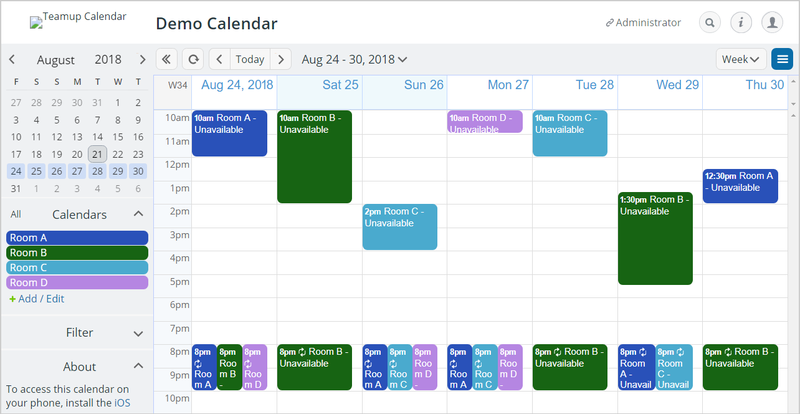 If you are using the calendar to reserve resources or spaces that can not be used simultaneously, you can prevent double-booking with one simple change: set existing sub-calendars to not allow overlapping events. Then create the series of ‘blocked’ events in each sub-calendar; the blocked events indicate that the resource or space is unavailable for that day/time, and prevents anyone from booking it when it is not available. 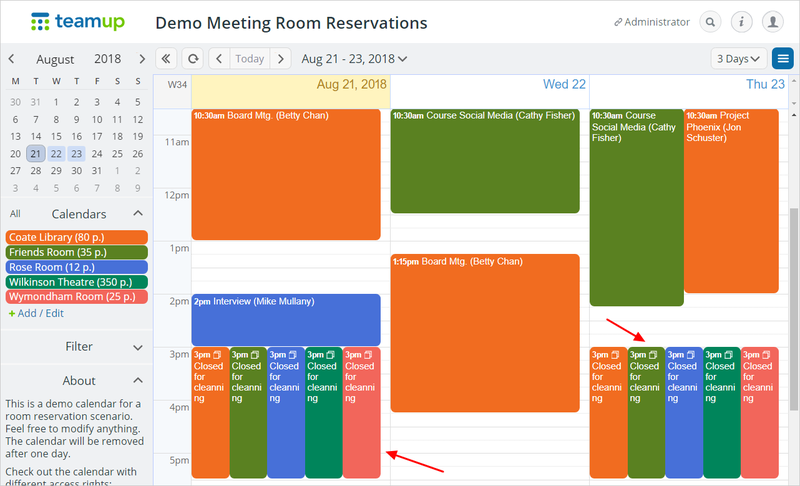 You can use the recurring feature to make creating these blocked events more efficient; for example, if a particular meeting room is always unavailable on Saturday mornings, you can create one event for that time and set it to repeat as long as necessary. First, create a sub-calendar for each conference room. Next, set each sub-calendar to not allow overlapping events. Finally, create events for each room to block the unavailable time; give them the title Unavailable or Reserved, or something similar. Another helpful feature is the ability to assign one event to many sub calendars. You can create an event and assign it to all sub-calendars to block off that time slot. For example, if a facility will be closed for a holiday and you wish to block all meeting rooms as unavailable, you can use this method. Create one “blocked event” for the time period in which the facility will be closed. Then assign that event to all the sub-calendars for all the meeting rooms. The “Closed for cleaning” event at 3pm is assigned to multiple sub-calendars.